We are the Football Strength and Conditioning Staff for the University at Buffalo. Our job is to make sure the athletes have the highest level of mental and physical preparation for the field of play. We spend more time with the athletes than any other coaches year round. We also take responsibility for their passion, toughness and excitement on a daily basis. We are looking to raise money for a great addition to our weight room. 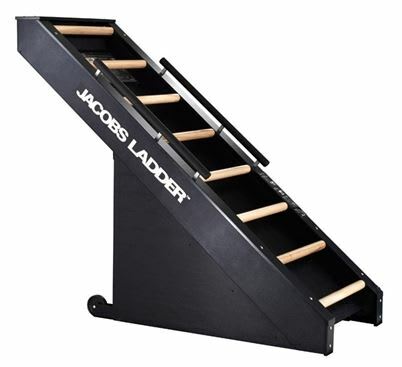 We would like to purchase a machine called the Jacobs Ladder. Buffalo doesn’t have the friendliest weather to run outside all the time, so we are trying to accommodate for that. This machine will give our players a unique option to get the same kind of conditioning as running would. It’s designed for a total body workout that would challenge our players and help them improve. No longer would our players have to stress about finding a place to do cardio on their own in the winter. This is WHY we need YOUR help! We are asking YOU, our loyal fans, families and friends, to help us out by contributing to the purchase of the Jacobs Ladder. Your tax deductible contribution is a true testament to UBelieving in our student athletes. Thank you for your consideration and generous support! Go Bulls! Thank you for your gift. Coach Lew will gladly do 25 push-ups immediately for you! Thank you for your gift. Coach Lew will squat 135lbs X 50 reps immediately with excitement for you! Thank you for your gift. Coach Lew will curl 100lbs. on the bar immediately with passion for you! Thank you for you gift. Coach Lew will complete 250 dips immediately with the great news from you. Thank you for your gift. Coach Lew will immediately complete 500 reps combined of push ups and pull ups for you! In addition come to any lift you want and observe (date TBD). Thank you for your gift! Coach Lew will RUN THE WHOLE STADIUM immediately and give you the biggest shout out ever on twitter! In addition come to any lift you want to observe (date TBD). WE GET TO LIFT TOMORROW! Thank you for your gift supporting the ENTIRE project! Coach Lew will RUN the WHOLE STADIUM, give you the biggest shout out on twitter, you can come to any lift and observe a team lift, PLUS have the opportunity to lead our team in a breakdown before practice!